The unique culture and cuisine of Delhi displays a generous blend of diverse influences. Our rich regional cuisines with time have interacted and influenced each other in a way, giving rise to new flavours and cuisines. The glorious historical past of Delhi impacted its food no less. The cuisines of Delhi saw Hindu-Rajput, Bania, Kayastha, Turkish, Arabic, Perian and Mughal influences due to the culturally diverse emperors that ruled Delhi over the centuries. The influence of Mughal food had the longest influence, so much so that Mughal cuisine and Indian cuisine became synonymous. Due to its vibrant food tradition- both non-vegetarian and vegetarian, delicacies and street food Delhi ranks as the gastronomical of India. Our team of city explorers are unsurpassed in knowledge and ensure that your walking tour exceeds your expectations. We at Delhi Walks would be delighted to be of assistance in planning and executing all your sightseeing requirements. For the best street food experience visit Old Delhi. It offers a wide range of variety. 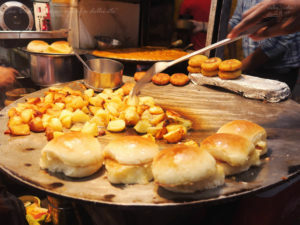 The famous paranthewali gali and lanes of narrow lanes of Old Delhi offers the best stuffed breads deep-fried in ghee, sweets, chaat, chole bhature, jalebi, rabdi etc. Chole bhature, jalebi and warm milk are preferred breakfast. The Jama Masjid area is ideal for mouth-watering and tasty non-vegetarian delicacies like mughlai, kebabs, tandoori items and Mughal sweetmeats at Ghantewala Sweet etc. From Aaloo-Gobi to bhindi-Karela to meva-rabdi you can find everything in this exotic area of Delhi. Since Delhi is a cultural hub there nothing that you will not find here. If you begin with Old Delhi or Purani Dilli you may indulge yourself in exquisite street foods with a variety of dishes that you can choose from. In fact there are exclusive lanes dedicated to food in this part of Delhi. The exclusive lanes dedicated to food has its own range of cuisines. You can Nehari at Bismillah and Afghani pulao and green tea at Pathanwadi. Kulle, a unique chaat made by scooping out the centre of a tomato, banana, cucumber or sweet potatoes and filled with chick peas, pomegranate, lemon juice and spices; sandwiches, samosas, tikkis, golgappas, papri chaat and tikkis are the all-time favourite of Old Delhi. The Kebabs and biryanis from Pandara road, sweetmeats and chaats from Bengali market are worth mentioning. Delhi has something to offer every food-lover. Whether you want to spend your evening dining in an elite boutique restaurant near Connaught Place, Chanakyapuri, Qutub Minar, Khan Market, GK I and II, Defence colony or Hauz Khas or a simple exotic meal at roadside jam packed “dhabas” Delhi is sure to tantalise your taste buds. Above all, Mughlai cuisine has the highest demand among outsiders and Delhiites. Mughlai- a cuisine borrowed from the Mughals who ruled Delhi in the medieval times is pretty popular in Delhi, North India and the world for its spicy flavor and aroma. For a mind-numbing food experience try the spicy treats offered at Old Delhi, near the Chandini Chowk metro station. Pamper your sweet tooth with the Rabri Faludas from Giani’s near Fatehpur Masjid in the same area. To experience the best of state foods visit Dilli Haat. Know more about your culture and cuisines at this extraordinarily colourful market. For Asian, Continental and European cuisines a number of restaurants and cafes can be tried at Connaught Place, Saket, Hauz Khas, Defence Colony etc. For quick bites, Subways and Mc Donald’s are quite popular in Delhi. Do not dread the ‘red and green chili’ used greatly in Indian foods for our food has attracted a number of Westerners. Lately, European cuisine has gained so much popularity in Delhi that a number of fusion restaurants have come up. We are expert in walking tours and we’ve earned a solid reputation for our passion, enthusiasm and importantly, our sense of showcasing the character of the city. We operate under the umbrella National Award Winning brand INDIA CITY WALKS and our selection of walks offer spectacular city experiences in Delhi and across India. Feel free to contact us in order to find out which walk suits you best. You can reach us through email share@delhiwalks.in or call us +91 989 969 2790 during weekends and holidays or fill the contact form. We are passionate about travel and love to talk about it with you!